Now we're talking. 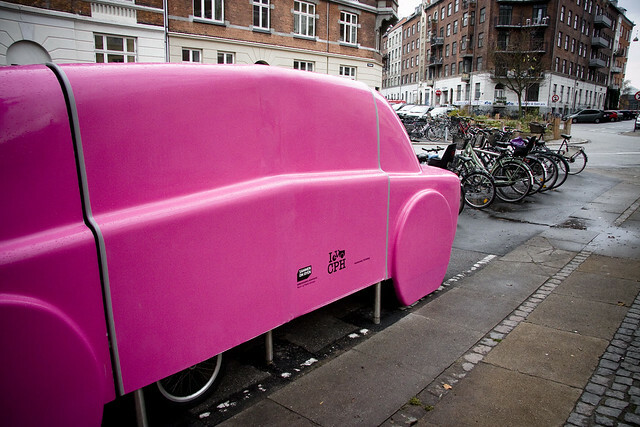 The City of Copenhagen's Bicycle Office launched an exciting pilot project today in the Vesterbro neighbourhood of the city. Enter: The Cargo Bike Car. Secure parking for four cargo bikes in the same space on the street that one car takes up. The symbolism speaks for itself. You park your cargo bike inside a car. Brilliant. Copenhagen is cargo bike heaven. 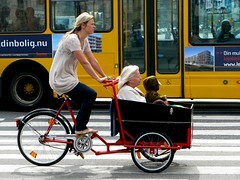 Copenhagenize.com's Flickr set - Danish Cargo Bike Culture - will attest to that. The City's Bicycle Office is keen to improve conditions for the city's cargo bike owners. The number of cargo bikes on the streets has exploded and 6% of all households in the city own at least one cargo bike. 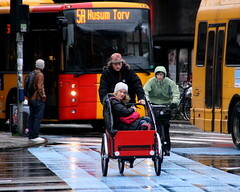 Copenhagenize.com estimates that there are roughly 30,000 cargo bikes in the city. 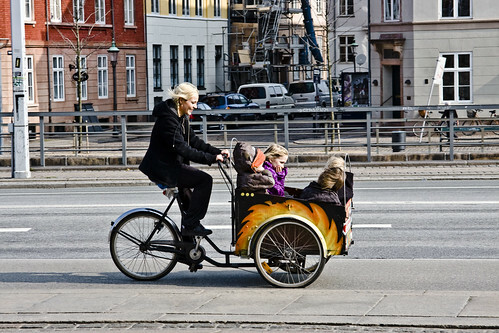 Actually, 25% of families with two or more children have a cargo bike and 50% of all Copenhageners with a cargo bike use it to transport children. Interestingly, only 2% of Copenhagen cyclists find cargo bikes irritating. In addition, 22% of cargo bike owners in the city have the bike instead of a car and 24% use their cargo bike as a supplement to their car. 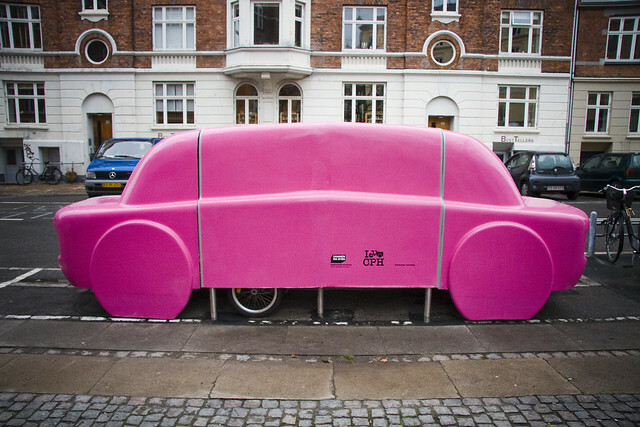 Car ownership is also very low in Copenhagen. Only 29% of households have one. This cargo bike craze is positive because people are using the cargo bikes to replace cars and car trips in the city. At the same time, the development is an interesting challenge for the city's traffic planners. Including how to park them effectively. They can be tricky to get through the doorway to the back courtyard and you can't really leave them on the sidewalk like a normal bike as they take up too much space. ”The many Copenhageners who invest in a cargo bike help make Copenhagen a more sustainable and liveable metropolis. We must, of course, take the cargo bikes into consideration when planning. And we do that by offering them some proper parking spots". Here's how it works. 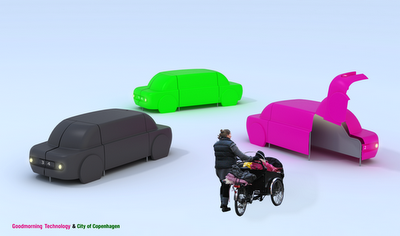 The new cargo bike 'car' is a pilot project running for six months, after which the experiences of the users and neighbours will be evaluated, as well as the condition of the fiberglass 'cars'. The shell is made of fiberglass and is comprised of four separate cabins, each with room for one bike. This means that four bicycles can park in the space normally taken up by one car. The 'car' has four solar powered 'headlights' that turn on in the dark hours. In addition, a solar powered light turns on inside when one of the doors is opened. Hooks and a net are mounted on the walls of each cabin, for hanging up rain clothes and other gear. 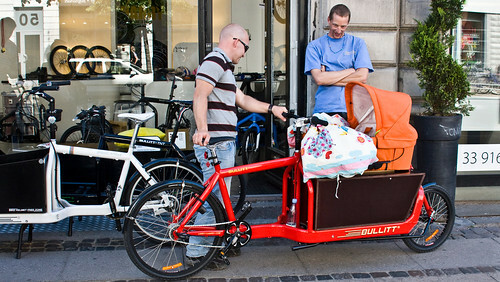 During the test period, selected cargo bike owners will recieve a key for a cabin. In the long run, the idea is that cabins will be available for a parking fee, much like we now have for local car owners. The model at the top is one of two prototypes. The location for the other one is not yet decided. The current test takes place at Krusågade 24, in Vesterbro.